The proposed relocation of a homeless camp to San Jose's Willow Glen neighborhood was put on hold Monday, and the Valley Water District committee asked the city for an extension as it began looking at other sites. The proposal to move Hope Village to Willow Glen came six days ago and received major opposition from neighbors. City Councilwoman Dev Davis, along with Hope Village's co-founder, proposed the site just off Highway 87 at Willow and Lelong streets. She made the announcement at a charged community meeting Monday night. "Hope Village, for the time being, will not be coming to the Willow And Lelong site," Davis said as the crowd applauded. Many neighbors indeed cheered the fact the homeless camp won't be moving in. "I think it's very important that they have the community outreach, to reach the neighbors and let them decide what is good for their area," said Elizabeth Estensen of the Willow Glen Neighborhood Association. Hope Village gives 17 homeless people a tent, meals, showers and bathrooms on a secure site. It needs to move by March 30 because its current location on Ruff Drive in a parking lot next to the SEIU Local 1877 building is too close to Mineta San Jose International Airport and is not zoned for residential use. Mayor Sam Liccardo said the community may not want Hope Village in their neighborhood, but they have to find ways to house the city's 4,300 homeless people. "I don't believe sanctioned encampments work," Liccardo said. "I believe we need to build housing. We may need to build tiny homes and less expensive and cheaper forms of housing that we can get up and running. But I think housing is the solution and not a bunch of tents." 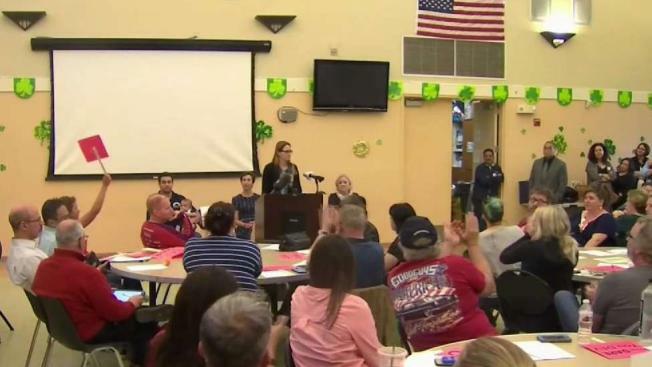 Some Willow Glen residents vowed to keep fighting. "My owning a piece of property doesn't make me more of a human being," resident Vera Sloan said. "My property value is not more important than someone else's right to survive and experience basic safety." The San Jose Housing Department is scheduled host a community meeting about the relocation of Hope Village Wednesday at the Elks Lodge at 444 W. Alma Ave. The City Council is slated to discuss the topic March 26.